The St. Vincent de Paul Society at Our Lady of Mt. 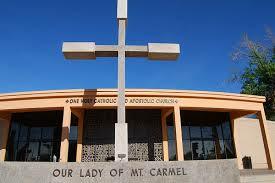 Carmel church in Tempe is part of the largest lay Catholic charitable organization in the world. We are committed to serving people in our community who find themselves in a difficult situation. Visiting them in their homes, we assess their individual needs and provide emergency food boxes, help pay rent and utility bills, offer clothes and furniture vouchers, and refer them to other organizations. Our assistance encompasses the whole person, addressing not only material but also spiritual needs. We are grateful for the generous support of our parishioners who donate their time, talent, and treasure so that people in need feel cared for by their community, regain hope, and experience the love of our Lord. New volunteers are always welcome to join us. Would you like to ﻿become a volunteer﻿? Would you like to ﻿learn more about SVdP﻿? ﻿Read our newsletters﻿ and learn how you can help ﻿﻿serve your community﻿﻿ by praying for us and ﻿donating to our conference﻿. The video "St. Vincent de Paul Society at OLMC" shows you day-to-day operations of the St. Vincent de Paul Society in our parish. The video "We are the Society of St. Vincent de Paul" provides an overview of the services offered by the St. Vincent de Paul Society. 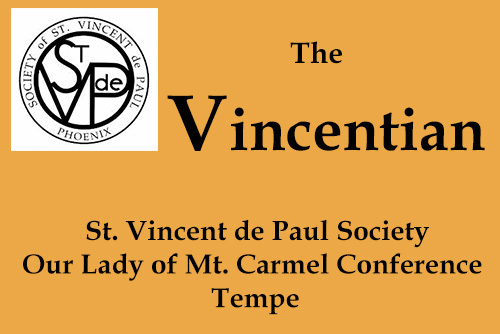 Our quarterly newsletter, The Vincentian, informs our members and donors about the work of the Society at Our Lady of Mt. Carmel in Tempe. Our conference responds to the material, emotional and financial needs of families. 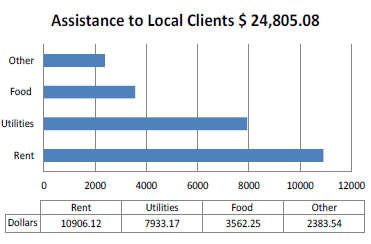 We rely on donations from our generous parishioners. Use your time and talents to serve your community by delivering food boxes, answering our office phone, helping in the pantry, etc.